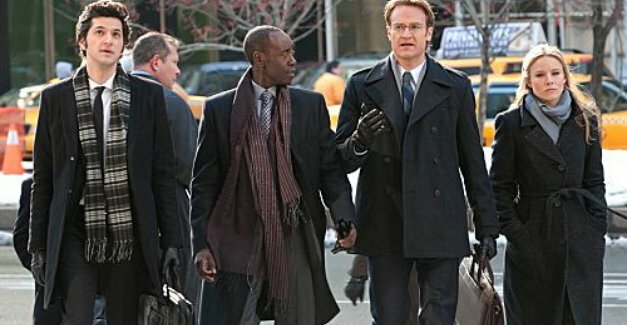 House of Lies is about a group of consultants. Props here to the idea of using consultants as the basis for a show; there has never been any show focusing primarily on consultants that I can think of; the closest pop culture has is Dogbert from Dilbert comics. These consultants play into whatever existing management consultant stereotypes there are; that they’re sleazy, that they don’t really contribute anything to either their clients or to society; that they have a whole bunch of jargon that doesn’t really mean anything. The group is actually a team, led by Don Cheadle’s Marty Kaan, and including Kristen Bell’s Jeannie van der Hooven, Parks and Recreation’s Jean-Ralphio’s Ben Schwartz as Clyde Oberholt, and Josh Lawson’s Doug Guggenheim. Kaan is the leader and the amount of confidence and trust the team has in him is not always clear. They’re supposed to be debaucherous and political incorrect. They’re extremely unethical, but as we learn, it’s not just them – that’s how their chief competitors work as well, with a team led by Marty’s ex, Monica Talbot. Marty attempts to woo, and then manages to piss off a member of the company he’s consulting on at a disastrous dinner where the prostitute Marty brought as a date ends up hooking up with his client’s wife in the bathroom (played by second season of True Blood’s Anna Camp). However, he and his team make up for it by winning over the higher CEO with a bunch of brilliant ways to screw consumers. There’s a B story in the first episode about Marty’s home life, particularly about his dad, who watches over Marty’s son while Marty’s traveling (played by Glynn Turman – best known as Mayor Clarence Royce in The Wire), and his son, Roscoe, who appears to be pre-gay (see: Curb Your Enthusiasm), Roscoe wants to try out for the female lead in the school play. Marty is initially hesitant but eventually relents and lets his son be himself. House of Lies has a classic case of beginner’s sitcom sickness. It doesn’t really know what it wants to be exactly. It’s trying different things, experimenting in an actual episode to see what clicks and what doesn’t, and it ends up all over the map. I’m not sure there’s one style here that will work perfectly, but it appears scattered and non-cohesive. That said, it’s not incredibly uncommon in a sitcom pilot to be still figuring out what works, but House of Lies is probably more behind the ball than most. I don’t think it’s a hopeless case – it’s not a particularly memorable show, but there are snatches of laughs and minor smiles to be had intermittently and the cast is a talented one. Don Cheadle is a sitcom newbie, who has mostly appeared in dramatic roles, and in mildly comedic roles in the Ocean’s film and he clearly is also having issues figuring out how exactly to act the part. Will I watch it again? Maybe – it was such a jumble that it is hard to know whether it could find itself, and if it could, what it would find, but it has Kristen Bell and Jean-Ralfio, so that’s two points in its favor. This is a show that, for better or worse, would be cancelled by now on a network, but will get a second season on Showtime.